On the 21st (Mon), pause for some photo ops at Kings Park War Memorial and then admire the natural beauty at Kings Park & Botanic Garden. 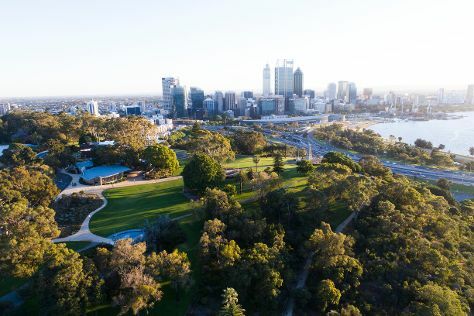 On the 22nd (Tue), you'll have a packed day of sightseeing: don't miss a visit to Elizabeth Quay, contemplate the long history of The Perth Mint, and then contemplate the waterfront views at Swan River. To find photos, reviews, other places to visit, and tourist information, you can read our Perth trip itinerary tool . Sydney to Perth is an approximately 7.5-hour flight. You can also drive; or do a combination of bus and train. The time zone difference when traveling from Sydney to Perth is minus 2 hours. Traveling from Sydney in January, you will find days in Perth are somewhat warmer (38°C), and nights are a bit cooler (20°C). Wrap up your sightseeing on the 22nd (Tue) early enough to travel to Kalgoorlie-Boulder. Kick off your visit on the 23rd (Wed): get great views at Mount Charlotte Reservoir and Lookout, then examine the collection at Museum of the Goldfields, then admire all the interesting features of The Superpit, and finally sample the tasty concoctions at Beaten Track Brewery. To see ratings, more things to do, maps, and tourist information, you can read our Kalgoorlie-Boulder route maker tool . You can fly from Perth to Kalgoorlie-Boulder in 5 hours. Other options are to drive; or take a train. Expect a daytime high around 39°C in January, and nighttime lows around 21°C. Wrap up your sightseeing on the 23rd (Wed) early enough to travel to Cocklebiddy. On the 24th (Thu), look and learn at Eyre Bird Observatory. To find reviews, photos, maps, and more tourist information, you can read our Cocklebiddy vacation planner. Drive from Kalgoorlie-Boulder to Cocklebiddy in 6.5 hours. Alternatively, you can fly. On the 24th (Thu), wrap the sightseeing up by early afternoon so you can travel to Nullarbor. On the 25th (Fri), look for all kinds of wild species at Nullarbor National Park. To see where to stay, traveler tips, more things to do, and more tourist information, refer to the Nullarbor trip planning website . Traveling by car from Cocklebiddy to Nullarbor takes 7.5 hours. Alternatively, you can fly. Due to the time zone difference, you'll lose 1 hour traveling from Cocklebiddy to Nullarbor. Finish up your sightseeing early on the 25th (Fri) so you can travel to Ceduna. Ceduna is a town in South Australia located on the shores of Murat Bay on the west coast of Eyre Peninsula. Start off your visit on the 26th (Sat): see the interesting displays at National Trust Ceduna School House Museum, then make a trip to Ceduna Jetty, and then explore and take pictures at Head of Bight. To find maps, photos, more things to do, and more tourist information, read Ceduna road trip site . Traveling by car from Nullarbor to Ceduna takes 6.5 hours. Expect a daytime high around 33°C in January, and nighttime lows around 19°C. Finish your sightseeing early on the 26th (Sat) to allow enough time to travel to Broken Hill. Kick off your visit on the 27th (Sun): get great views at Mundi Mundi Lookout, explore the world behind art at Pro Hart Gallery, look for all kinds of wild species at The Broken Hill Sculptures & Living Desert Sanctuary, then take in the architecture and design of School of the Air, and finally view the masterpieces at Howard Steer Art - Flying Doctor Artist. 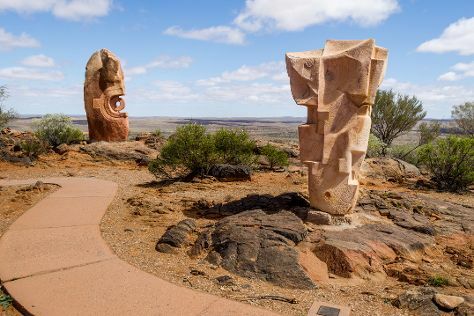 To see photos, more things to do, where to stay, and more tourist information, use the Broken Hill trip itinerary maker site . Getting from Ceduna to Broken Hill by car takes about 9.5 hours. Other options: fly. In January, Broken Hill is a bit warmer than Ceduna - with highs of 38°C and lows of 28°C. Cap off your sightseeing on the 27th (Sun) early enough to travel to Nyngan. Nyngan is a town in the centre of New South Wales, Australia, in the Bogan Shire local government area within the Orana Region of central New South Wales. On the 28th (Mon), get engrossed in the history at Nyngan Museum, then examine the collection at Mid-State Shearing Shed Museum, then pause for some photo ops at The Big Bogan, and finally don't miss a visit to Helicopter Flood Memorial. Before you visit Nyngan, use our trip planner to discover what you can do and see there. Traveling by car from Broken Hill to Nyngan takes 6.5 hours. Wrap up your sightseeing on the 28th (Mon) early enough to travel to Moree. Moree is a large town in Moree Plains Shire in northern New South Wales, Australia. Kick off your visit on the 29th (Tue): take in the dramatic natural features at Waa Gorge and then explore the galleries of Bank Art Museum Moree. To see more things to do, traveler tips, reviews, and more tourist information, you can read our Moree day trip site . Traveling by car from Nyngan to Moree takes 5 hours. January in Moree sees daily highs of 39°C and lows of 24°C at night. 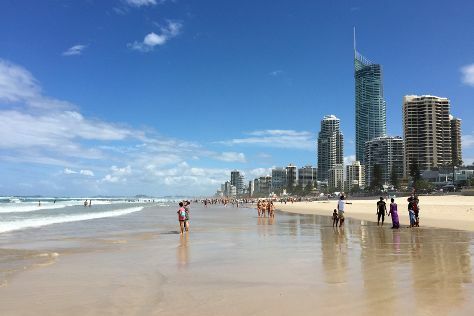 Wrap up your sightseeing by early afternoon on the 29th (Tue) to allow time for travel to Gold Coast. Gold Coast is known for theme parks, shopping, beaches, nightlife, and zoos & aquariums. Your plan includes some of its best attractions: find something for the whole family at Sea World Theme Park, buy something for everyone on your list at Marina Mirage, enjoy the sand and surf at Burleigh Heads Beach, and enjoy breathtaking views from SkyPoint Observation Deck. Inspirock's itinerary builder makes planning a Gold Coast trip simple and quick. The Route module can help you plan travel from Moree to Gold Coast. Traveling from Moree in January, you will find days in Gold Coast are slightly colder (33°C), and nights are about the same (24°C). Wrap up your sightseeing on the 1st (Fri) early enough to travel back home.